Even though San Francisco is a small city, there are so many cute neighborhood gems located in every area. In Hayes Valley, I stumbled across an adorable Eastern European inspired bakery and café called 20th Century Café. 20th Century Café offers homemade pastries/desserts such as potato knish, babka (brioche-like yeast cake), Krasinski Torte (Russian honey cake), Sacher Torte (chocolate and orange marmalade cake) and Linzer Torte (short pastry tart with fruit jam). During lunch hours, they offer a small menu of salads, soups, and sandwiches. 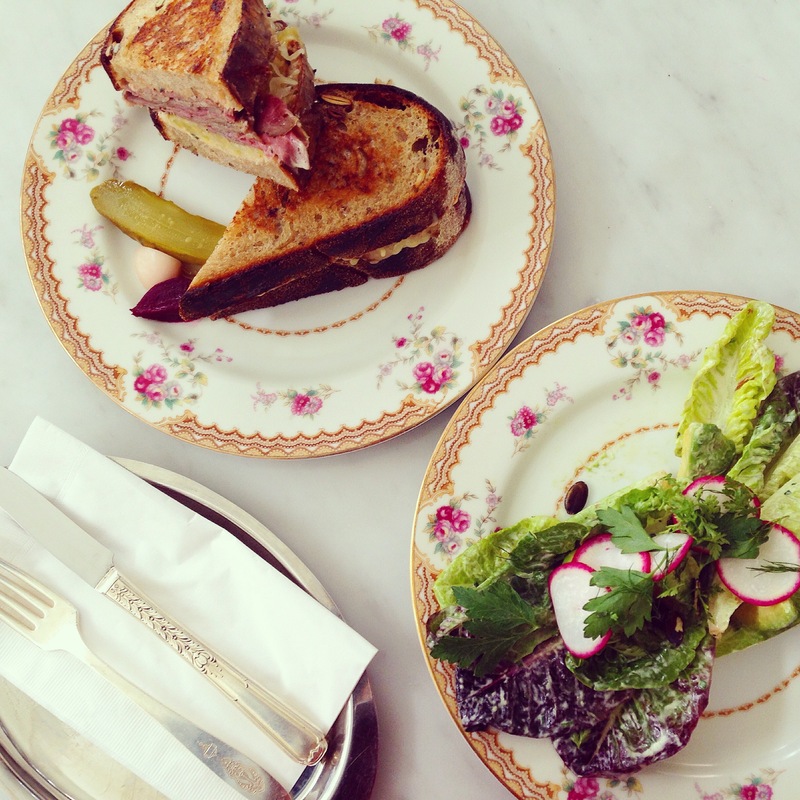 Reuben Sandwich (8.5-9/10) and Little Gem Lettuce Salad (8/10). 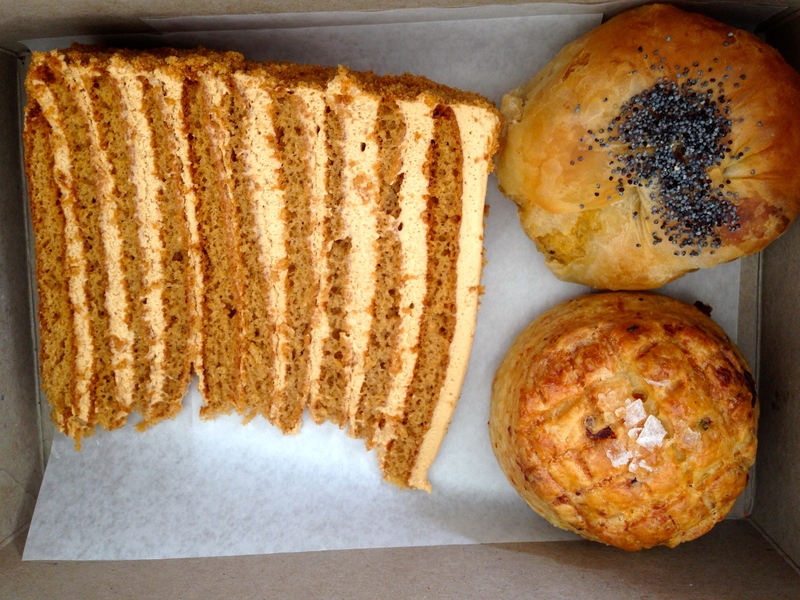 Krasinski Torte (9/10), Potato Knish (8/10), and Bacon Cheese Scone (8.5-9/10). The reuben sandwich was so satisfying! Toasted thick crusty rye bread flavored with caraway seeds with layers of tender pastrami, sauerkraut, melted nutty Comté cheese, and creamy Russian dressing. Definitely a must if you come here. The little gem salad with chunks of avocado and radishes was tasty but slightly small compared to the price so I’d skip it. Both of the soups that day, the borscht and green garlic, looked delicious as well. Now, one of their signature desserts is the Krasinski Torte, a beautiful multilayered moist cake with velvety honey cream. I highly recommend it! The potato knish, a pastry filled with mashed potatoes, was yummy but I preferred the bacon cheese scone. I really enjoyed the food and ambience at 20th Century Café but since it is on the pricier side my rating is a 8.5/10.